Angelo Mathews didn't hide his disappointment after Sri Lanka had "a terrible day" at work in the second one-day international against South Africa, losing by four wickets. Having put up just 244/8 after opting to bat in Dambulla, Sri Lanka surrendered to Quinton de Kock's belligerent 87 as South Africa chased down the target in just 42.5 overs to go 2-0 up in the series. "We gave away too many wickets up front [56/3], and then we lost wickets at crucial times too, so we never got going. We didn't hold on to catches as well, and while defending low scores, you need to hold on to every chance. We had a terrible day on the field," Mathews said after the match. "Neither did the bowlers bowl well. We were a bunch of schoolkids when it came to today's fielding." 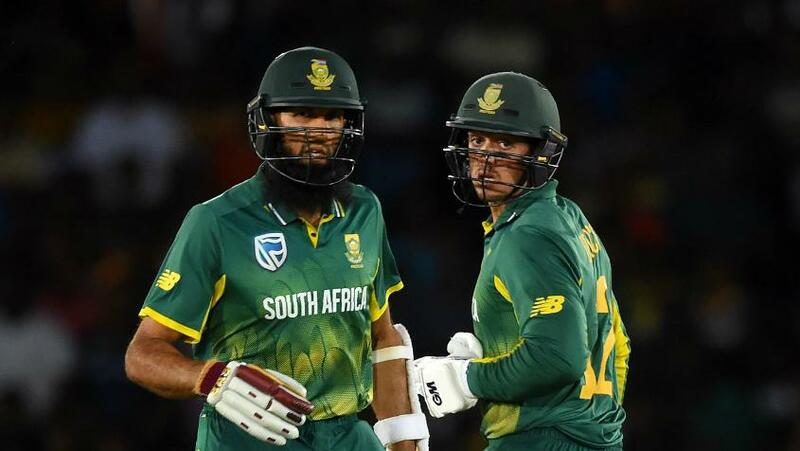 De Kock and Hashim Amla (43) were both given reprieves early in the South African innings, and the batsmen cashed in, adding 91 runs for the first wicket to put South Africa in a commanding position. Faf du Plessis (49) and JP Duminy (32) did the needful after that. Niroshan Dickwella, who scored 69 alongside Mathews' 79* to help Sri Lanka recover from 56/3, agreed with Mathews that Sri Lanka made too many mistakes on the field. "We made mistakes throughout the game. If we want to win a match, we can't make so many mistakes," Dickwella said. Dickwella's dismissal in the 26th over at a team total of 123 after he and Mathews had added 67 runs for the fourth wicket initiated a middle-order collapse and Sri Lanka went from 123/3 to 227/8, leaving Mathews with too much to do. "Maybe you can make two or three mistakes and fix those things within the game itself and win the match. But if you make mistakes through the match, it's hard to win," added Dickwella. The mood was quite the opposite in the South African camp, as du Plessis and his team made full use of 'more favourable' conditions. "These conditions are favourable a bit more. Batting second was going to be tricky, but pleased to see how we played," du Plessis said. "It was a good one-day wicket. But I'm very pleased at how we are chasing the game. We are staying positive, putting pressure on the opposition and so on." De Kock, who was also named the Player of the Match, was relieved to find the efforts off the field, in terms of preparations, working well during match situations. "Nice to know the work you're doing off the field is paying off. The last tour has been really difficult, and it's always challenging to bat in the subcontinent," he said. "The pitch played the same all day. It was slower as the day progressed, but it was a similar pitch through the game."